On this page, i tried to collect information about systems from MAI Basic Four i found or remembered. I have also some files for MAI machines here. Btw, i'm looking for a BOSS/IX tape or the contents of the tape for my MAI system 2000 (BOSS/IX release 7.5B*22), if you have such a tape or know someone who may help me out, please contact me. The first systems were based on machines developed by Microdata Corporation. I only have a few information about these systems but the schematics for the cpu, the disk controller and a terminal (7220 and 7230) are available at bitsavers. From the schematics, you can see that the Basic Four systems schematic (LD1010_Model_1200_CPU_Logic_Diagrams_Aug73) equals the Microdata 1600. The systems run an Businness Basic (BB-I and BB-II) operating system by Basic Four. MAI models were 400 & 600 models eqiped with core memory. 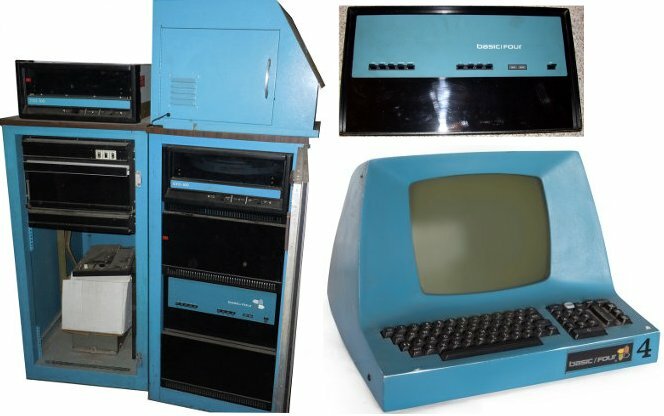 Rhode Island Computer Museum has two models 1200 from 1976.
fixed disk (110,210 (see pictures),310). Information about the priam drives (3350,6650 and 15450) is available on bitsavers. (Product description OEM Manual) The 1600 system is a 5 1/4" fixed disk system. Disk drives used may be Rodime, Micropolis, or Maxtor. There were two cpu's available for these systems: 132x (slow speed) and 135x (lightning) CPUs (510, 610, 700 & 730). As the BB1 and BB2, BB3 and BB4 were businness basic only machines. The basic was powerful and contained keyed file (INDEX and SORT) that worked with hashes CHECK. The disk format used some kind of SORT file for the dictionary (sorted by sector number). When a file had to be created, the starting sector number and the size had to be specified. All files where fixed length files. Later there was also a hard disk available (as shown on the picture). As this was not included in the original design, the controller was inserted into the Z80 CPU socket (similar to gide). The harddisk was only usable with BB/M, only the formatter had to be executed under CP/M. About 1982 my father bought such a machine for his company and while i played with that machine in the age of 16, i learned how easy it was to programm businness applications with the MAI basic. A year later i was able to lend such a machine. I used it to write a new software for my fathers shop. This was a lot more comfortable than the software that has been written by a local software development company for the S/10 and it was designed to support ghost tasks, line editing and more than one Terminal. When i was finished, my father bought an MAI system 2000 in 1985, this system was equiped with 5 terminals and 2 printers, more under system 2000. Apart from some disks (CP/M, utilities and some stuff written by me) i dont have any stuff about the S/10. I would be interested in a technical manual about the machine, with that it would be possible to wite an emulator for the S/10. In case you have such a manual, please contact me. A BB/M bootdisk as well as the BB/M utilities disk is available on Dave Dunfields page, he wrote a universal disk read- and write program for dos that is able to read the copy protected bootdisk. The other (not copy protected) disks can be read via a linux machine, i wrote a small program in freepascal that can transfer these disks as well as other formats (as long as each track has the same number of sectors and sector size) to a disk image. In addition i write a small hack to extract files from the disks, this includes converting the binary stored basic programs to readable ascii files. 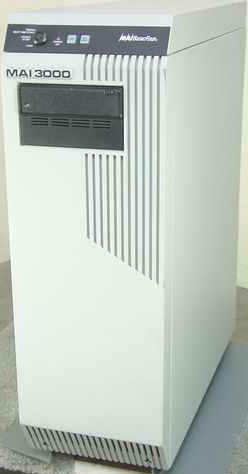 The MAI system 2000 was introduced in 1984. It consists of a desktop sized central processing unit and an external 1/4" streamer (Tandberg TDC 3350). Main CPU was a motorola 68010 clocked at 8 mhz. Base memory was 768 K (3 board), expandable to 1,5 MB. The system has 2 serial and one parallel port on the central board (CMB). One 4 way controllers (4 serial ports) were standard and 2 additional ones could be added. A maximum of 2 internal MFM harddisks are supported by the system. The CMB also conists of a floppy controller supporting 5 1/4" floppies (never used it). A few years Later, MAI offered a SCSI controller board to support 1/2" reel tapes (Model 4402 Cipher 1/2") also. The operating system was named BOSS/IX and in fact it was UNOS by Charles River Data Systems (CDRS). MAI licensed the source of UNOS from CDRS and used it for the sytems 2500,3000 and 4000. I dont know what have been changed by MAI but at least they added a copy protection. The machine has the serial number (and some key, to be verified) in nvram. The serial number could be written by a so called ssn-program that the MAI guys had on tape. For later machines, it was also required to replace a pal before write access to the serial number section of the nvram was granted. In addition there was a config record that containd the serial number in a crypted form. Also included was the maximum allowed memory and later the operating system version. This config record had to be saved to disk using dutil that was part of the diagnostic tape or during installation of BOSS/IX . Without that machine specific config record, the operating systems stopped within the boot process. However, they had included a lot of stuff from CDRS on the BOSS tape, there was a debugger, a c compiler, the menu system including source, informix, a pascal compiler and more. Some packages (i remember the pascal compiler) were protected by a key that had to be stored in a file. This was a to simple appoach, the pascal compiler generated the needed key and compared that key to the one in the keyfile, both keys where in memory where it could be seen by the debugger. 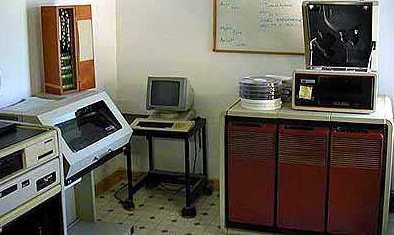 In 1984, cost for that machine ranged from $14,000 for a basic system to $62,000 for a complete system with 2 disks a 240MB, the external 45MB 1/4" streamer, a printer and 8 Terminals. The system i worked with was equipped with 2 Rodime 20 MB disks, 1 MB of memory and the standard 45 MB Tandberg 1/4" streamer. The system was equiped with 5 terminals (3 Qume QVT101, one MAI S/10 and one ICL Terminal and two printers (parallel OKI82 and serial OKI192). The software was witten in MAI basic, initially on an S/10, later developed on the system 2000. I few years ago i got a working system 2000 but unfortunately without the BOSS/IX tape. I'm searching for a tape or the contents of the tape for BOSS/IX release 7.5B*22. If you have such a tape or know someone who could help, please contact me. My email-address is at the end of this page. I have scanned the service manual for the machine and the tape drive as well as the error logging manual that survived over the years. These documents are available at bitsavers.org. I have some more manuals waiting to be scanned. The MAI 2500 was a replacement for the MAI 2000 based on the MAI 3000 hardware. It used the same cabinet as the 3000. 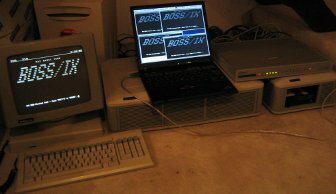 BOSS/IX 7.4B was the fist version that supported the 2500. I do not have any information or manuals for the system 2500. This was a 80286 4,77 or 6MHz) based machine running MSDOS 3.2 or BOSS 6.2 (BB6). BB6 was a multi-user operating system with Business BASIC integrated into the O/S. BB6 was similar to BB/M and BB4. The system supported the console and 2 additional serial connected termonals. Later there was a multi port serial board available to support more than 2 serial terminals. I do not have any information or manuals for the system 1500. The only information i have is an "Error Logging" manual that also contains a description of the diag tools (same for 2000,2500,3000 and 4000). Model 4000 was an extended system 3000. A model 3000 could be upgraded to a 4000. Using a expansion chassis, the system could have up to 7 disk drives as well as additional 4 way controllers. A maximum of 74 serial and 3 parallel ports where supported. Memory was expandable to 16 MB using new 4 MB memory boards. I do not have any information or manuals for the system 4000. Later models are based on intel CPU's and run BOSS/VX (SCO or AT&T Unix ?) with open basic by MAI. Thas was called "Dual Universe". I have two manuals, "BOSS/VX Refernce Manual" and "BOSS/VX System Administrators Guide".